I'm a big fan of granola. For about the last year I've come to make it almost every other week as a big bowl of plain yogurt, granola and fresh fruit has become one of my staples. This is post is a double whammy. BAM. BAM. One, my favorite granola recipe and two, a granola giving gift bag project. An easy to make bag from parchment paper for when you don't have tupperware to spare, glass jars to part with or because you look for any reason to use your sewing machine. Go, granola, go! These are the true reductions, and it seems tricky because they don't make .4 c measuring cups but it's granola - so for .4 c I usually just use a rounded 1/3 c. For .2 c, a scant quarter cup and for .1 c about half a quarter cup. I'm usually fairly generous with the coconut and I will add a hefty tablespoon of golden flax seeds. The golden flax seeds give it another bang of nuttiness, and well, I guess I'm big into that. I also sometimes double the amount of nuts - again, the nuttiness, what can I say? I've also been known to substitue agave nectar for honey when I don't have much or feel a pang of pain dumping nearly a half cup of good honey into this. Having said that, good honey, I'm positive makes all the difference. If you can, use it always, if not, try it at least once, it's quite noticeable. Combine the dries together in one bowl and the wets in another. Combine the two bowls and stir until the ingredients are well incorporated. Spread the mix thin on a baking sheet and bake at 250 degrees for about two hours. Toss the granola every 15 minutes or so and keep an eye on the browning, if it needs less time, take it out sooner; if it needs more, give it more. Let the granola cool, add dried fruit and store. You'll need a sewing machine and parchment paper for this and a bit of twill tape. 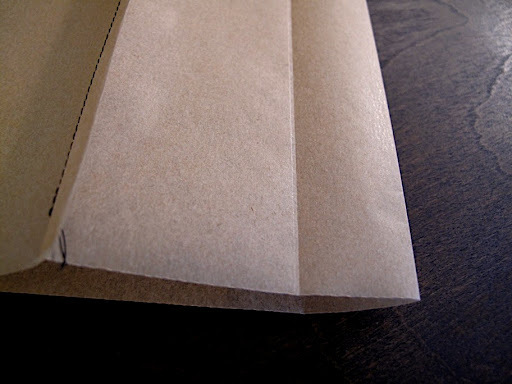 Cut a 18" long piece of natural parchment paper (mine is 12" wide). 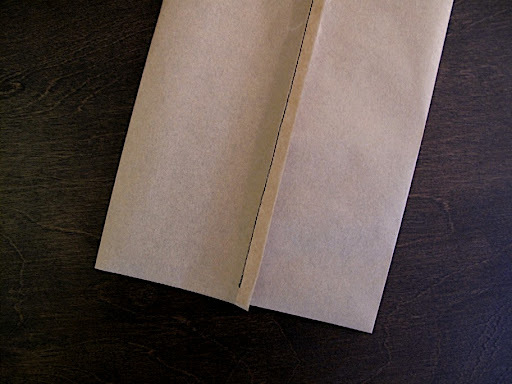 Fold the paper in half length wise but do not crease, this will preserve the front of your bag and keep it flat. You don't want to use pins or make this too complicated so just match the sides together and feed it through the machine carefully so that they stay together the entire length. Next, with the seam you've just created in the middle, press the tube flat, creasing and creating two sides. 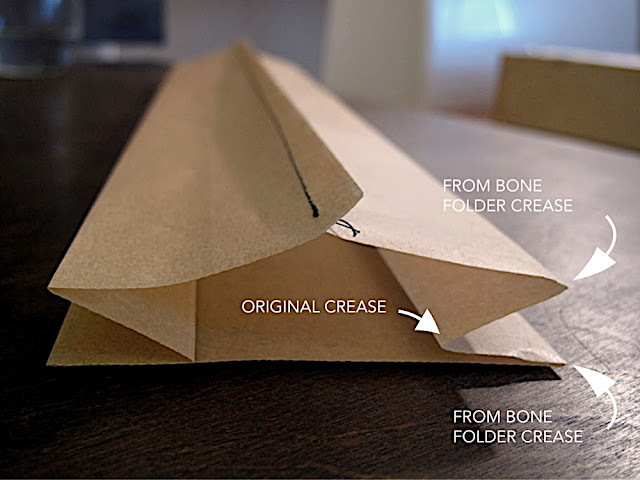 Use a bone folder and a ruler to create a crease 1" in from each side. Be sure not to press so hard that you puncture the paper. You'll be making this similar to the way a popcorn bag is constructed, hopefully that will help you visualize this next move. The first side crease you created will become an inside fold and you'll create a new crease on the top and bottom where you've marked with your bone folder. These two new creases will become the outside creases. I think the photo will explain better. Do this to both sides. At one short end of the bag fold the raw edge in and then in again. Stitch this seam in place. Your bag is now ready to be filled. When your granola has cooled, you've mixed in dried fruit - load it into the bag. Depending on how much you put in the the bag you may or may not need to trim the length some. Trim the bag to 2.5" inches from where your filled granola ends. Fold the raw edge in, then in again. 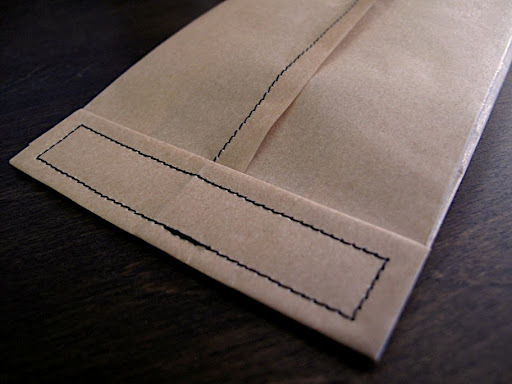 Insert a loop of twill tape perpendicular and in the middle, this will give you something to tear open the bag with. Stitch as you did the bottom end and you're done! And an added fun bonus is if you hold the bag, and pull the tag up the stitching will provide a perforated edge and you'll get a perfect open! I love this! I make lots of jam and chutney and jealously guard my jars. It would also be perfect for biscuits. And for that matter any present to make it a bit special.